District Cooling System: why is Direct Condensation Better? In this era of limited resources, energy efficiency and environmental conservation are critical steps for district cooling systems. Consider the Burj Khalifa in Dubai, the tallest building in the world. At 828m in height, the magnificent structure can be a nightmare to cool down. However, the cooling requirements of the gigantic structure are well sorted thanks to a district cooling solution. It is reported that the building uses HCFC-123 refrigerants. The tower also draws chilled water from a district cooling plant. Just imagine how getting it right in the district cooling plant would affect the operations of the several huge structures within a district cooling system. Even the smallest improvement in performance of such a system can have a remarkable effect on the economics and environmental conservation efforts. 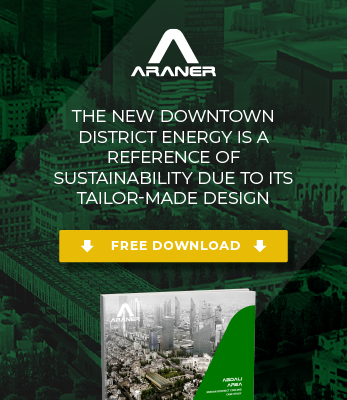 That explains why ARANER focuses on creating district cooling systems that are as efficient as possible, no matter where the users are located on the world map. Besides the work of professional engineers and the implementation of tailor-made solutions, success is achieved thanks to the use of the best technology. When it comes to the production plant, the choice of condensation technique matters a lot. This is why direct condensation is outstanding as the best option: up to 14 % reduction in the overall cooling plant consumption can be achieved, and the economic impact of this figure can hardly be ignored. In cooling systems, the heat gained by the chillers is rejected to the ambient during the refrigerant condensation process. Direct condensation is a technology that rejects heat gained into the ambient in one single step. Heat from ARANER Chiller for Direct Condensation is carried straight into the heat rejection device, instead of using a secondary loop which is the traditional solution (indirect condensation). First, the refrigerant rejects the condensation heat to a secondary water cycle and water temperature is increased. Then, a heat rejection device cools down water of the closed circuit, which can be a cooling tower, air radiator or seawater heat exchanger among others. The heat is then finally rejected from the closed water cycle to the ambient. The main difference between these two systems is the secondary water cycle used in indirect condensation, which is omitted on a direct system. In Indirect Condensation, if the ambient wet bulb temperature is 31° C and the cooling tower is used with an approach of 4° C then the cooling water will be 35° C. Water will be heated up to 39° C in the condenser, so the condensing temperature will be 41° C. The total approach is of 10° C.
With Direct Condensation, starting also at 31° C of wet bulb temperature, condensation takes place at a lower temperature of 39° C because the water temperature difference of the cooling water loop is eliminated, resulting in a total approach of 8° C.
Electrical consumption of the compressor is reduced up to 6 %. An extra 8 % of energy consumption is saved thanks to the deletion of the cooling water loops. The overall cooling plant energy consumption is reduced in up to 14 %. Another important advantage is the reduction in the cooling plant footprint. As the cooling water circuit and cooling water pumps are eliminated, for big cooling plants the required area can be reduced up to 40 %. District cooling is definitely finding an insatiable demand that ARANER and other firms must strive to cover. In line with the implementations, overall cost optimization and effect on the ecosystem should not be overlooked. With numerous success stories of direct condensation system installations across the world, ARANER is your reliable partner for top quality and excellence. Talk to us to understand more about how direct condensation can suit district cooling systems requirements economically and environmentally. Congratulations. Good ideas from a good team with an excellent vision. Keep it up.